Storage in non-bank regulated, top-tier secure storage facilities. Low storage fee, pay for what you store only. Option to liquidate your Silver & Gold at preferred rate. Detailed online statements, including photos and weight. Full insurance coverage at no additional cost. Peace of mind from dealing with BuySilverMalaysia, a company trusted by thousands of Gold and Silver buyers. Allocated storage: Photo as proof of Storage. Never have to worry on the shipping and receiving arrangement of your investments. "Protected, Allocated and Easy to Use"
^ Upon signing up with BSP, your parcel will be directly allocated to your BSM's user account. You will be able to view your parcel when you login to your BSM account. ^ Each parcel have unique identification and details are stated out clearly in your BSP account. You have the option to print out a downloadable hardcopy for your personal reference and safe keeping. ^ Example of a PDF downloadable Customer Storage Summary which includes important details such as duration of storage, ownership and nominee with photo identifications of your storage items. 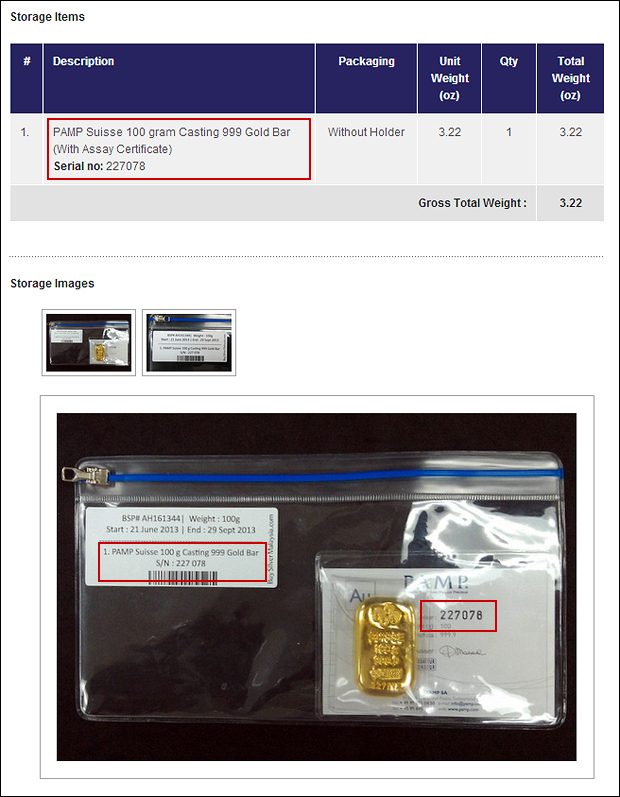 ^ Parcel identification includes barcode and matching serial number of your gold or silver bar. This further strengthen the transparency of BSP's storage service. 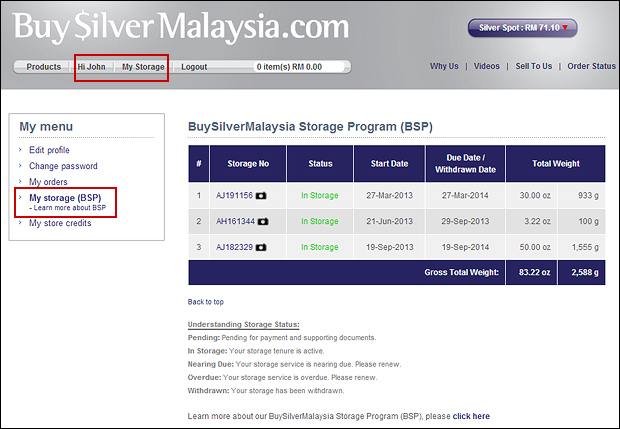 An administration fee of RM20.00 will be charged for the first storage program with BSM (One time fee). Subsequent storage program will not be charged this administration fee. You can request to view the item free of charge for the first time, within 30 days. Subsequent viewing will be charged RM50. 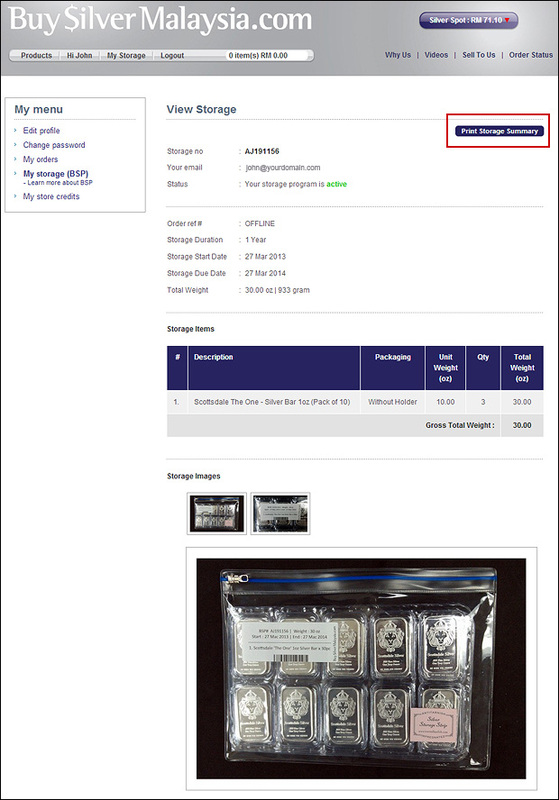 There is a minimum storage fee is RM50. This means that by the above calculation, if the storage fee amounts to less than RM50 from the specified storage period, you will be charged RM50 in that period. 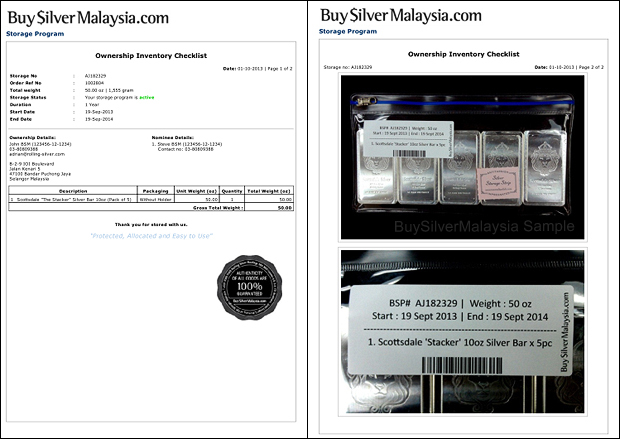 To start storing your Silver and Gold with BuySilverMalaysia Storage Program (BSP) account, call +603-8080 9388 or email us at admin@buysilvermalaysia.com to ask about the BuySilverMalaysia Storage Program (BSP). Attach a photocopy of Malaysian IC (MyKad) or Passport - Front & Back for identification purposes. There are no minimum purchases required to join BSP, customer can begin even with 1 oz but the minimum fee applies. Know more about storage policy. Please click here. 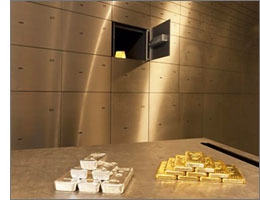 We buy back silver and gold bullion at prefered rate for storage. Please click here for rates.